How did you pick-up your favorites? It’s hard! I haven’t post mine yet but definitely, John Green and Suzanne Collins will be included! You’re too awesome to me, Tina! Great list! I’ve read Anna and the French Kiss, Paper Towns, Dash and Lily’s Book of Dares, Catching Fire, and Fire, and I really liked all of them. I also just bought The Knife of Never Letting Go, and I’m really excited to read it! 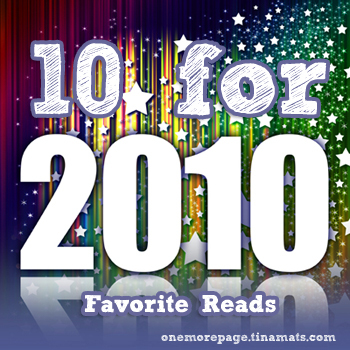 For 2010 my favorite reads are: The Graveyard book, Anansi Boys, American Gods all three by Nail Gaiman, The Hunger Games, and Catching Fire both by Suzanne Collins, When You Reach Me by Rebecca Stead, Graceling by Kristine Cashore, Jonathan Strange and Mr. Norell by Susanna Clarke, Lost City of Z by David Grann, Beautiful Creatures by Garcia and Stohl. Semi-favorites: Subtle Knife by Philip Pullman, Sabriel by Garth Nix, Percy Jackson Series by Rick Riordan. I hear When You Reach Me is very good. I have that on my wish list. :) And I still need to finish reading Percy Jackson. The paperback of the 5th book sure is taking its time to get here. Niiiiice list. I’m very excited for you to read the rest of the Ness books. And I second the When You Reach Me rec. Interesting, well-written, quick read. added it to my wishlist!